Musa hopes agencies will be fair in probing him | Daily Express Online, Sabah, Malaysia. 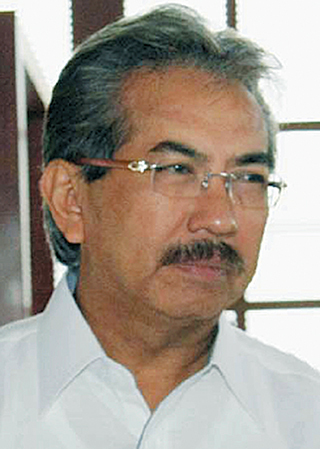 PETALING JAYA: Embattled former Sabah Chief Minister Tan Sri Musa Aman (pic) urged enforcement agencies investigating him to be independent and carry out their duties without any external pressure.Musa is under investigation by the police for criminal intimidation over his swearing-in as Sabah Chief Minister. "I would also like to reaffirm my faith in the judiciary, the Royal Malaysian Police and the Immigration Department. "They must always be allowed to carry out their duties independently and in good faith," he said in a written statement through his special officer, Awangku Faisyal. He added that the sanctity of the offices must be protected. Musa said that he intended to be sworn in as Sungai Sibuga assemblyman once his health permits. Musa, who returned to Malaysia on Tuesday, three months after leaving for the United Kingdom, was arrested by the police on Wednesday (Aug 23). However, Magistrate Norshahirah Abd Salim refused to grant the police application for remand during a hearing conducted at the private hospital suite in Kuala Lumpur where Musa was warded. During the remand hearing, Musa, through his lawyers, said he left the country legally to seek medical treatment and to attend to personal matters. His lawyers also denied he was the fugitive he had been made out to be by some quarters. The police proceeded to record his statement the next day over an alleged criminal intimidation report lodged by Sabah Yang DiPertua Negeri Tun Jahar Mahiruddin following the May 10 Chief Minister swearing-in ceremony at Istana Negeri here. This was done over Thursday and Friday. In KOTA KINABALU, Sabah Umno accused Parti Warisan Sabah of going on a "witchhunt" against Musa. "Where Musa is concerned, Warisan's quest is not justice but vengeance," said Sabah Umno chief Datuk Seri Hajiji Noor in a statement. He claimed that the Warisan-led state government was being vengeful after what he claimed to be an "unlawful" takeover of power from the legitimate Barisan State government after the May 9 election. "They have unashamedly using words like 'fled', 'fugitive' and 'wanted' in reference to Musa, even though it is not true," said Hajiji. He said Warisan leaders should also stop telling enforcement agencies how to do their job as was evident in the statements they made following Musa's return from the UK. "If Warisan thinks they are the rightful government, then stop acting like a bull in a china shop, and start running the government," added Hajiji, who took over as Sabah Umno Chairman from Musa. He accused the Warisan leaders of putting pressure on the enforcement agencies. "The authorities should be allowed to do their job without fear or favour," Hajiji said. It looks like Warisan wants the standard operating procedure to be on their terms, he said. According to Hajiji, physicians from the UK, Singapore and Kuala Lumpur have independently verified that Musa was indeed not well. Hajiji said Warisan should fulfil its manifesto and 100-days promise "to put Sabah on the right track". "The authorities should be allowed to do their job without fear or favour. "Such harassment is tantamount to abuse of power, an accusation they hurled against Barisan National leaders prior to GE14 for political mileage," the Sulaman assemblyman said. "Now they are acting like a bunch of spoilt brats, accusing the authorities of special treatment, telling them what the standard operating procedures should be and what enforcement agencies should do." "Sadly, some media outlets have been equally callous in their news coverage of Musa, simply publishing stories without checking their facts."